The Lioness app aims to leverage the stories and experiences of female advertising professionals worldwide. 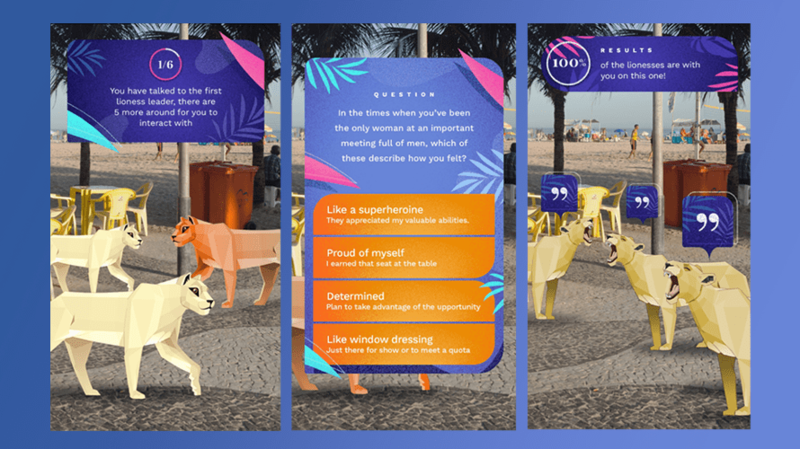 The WPP creative agency and tech behemoth partnered to create the aptly named Lioness app, which will use various Google tools to leverage the voices of women at agencies globally and immerse them in one another’s experiences. The app was originally slated for a June release to coincide with this year’s Cannes Lions International Festival of Creativity. Ogilvy and Google discussed their use of technologies like augmented reality in creative at a Cannes panel. The Lioness is now expected to launch sometime in the fall. What the app will offer is access to the critical female perspective in the male-dominated advertising space through Google tools such as the Tour Creator. That feature will allow users to tap into an “immersive 360” mockup of the daily lives of agency women, with a look into their offices, professional duties and the triumphs and tribulations they endured throughout their careers, according to Ogilvy’s Angela Fung, executive director, digital production. Fung told Adweek that the aim of the project is to break down the isolation reported by so many women in advertising—a sensation which too often pushes them out of the industry altogether. She noted that the project seeks input from female professionals at the associate level up to the C-suite. However, it is especially critical for ad women just starting out to hear from senior executives, when they often “had no idea” that these executives went through experiences so similar to their own. “A lot of experiences in the marketing industry are actually really common,” Fung said, but there’s currently no network to highlight them. Google’s many tools and tech solutions have provided “a real playground of possibilities,” she added. So far, 35 women have joined the Lioness network, including Tea Uglow, creative director at Google Creative Lab, who confesses to her own lack of confidence in the story she contributed to the app; Ogilvy’s Ee Rong Chong, Singapore group managing director; and Patou Nuytemans, CEO of MENA and chief digital officer of EMEA. The latter two leaders both discuss the importance of bringing emotions to the creative table. “We hope this initial set of lionesses will just be the beginning of a series where we’re able to bring the experiences of women in the marketing industry to life,” Fung said. The above video provides a behind-the-scenes view of how the app came to life. Ogilvy associate creative directors Terin Izil and Abigail Harris-Shea came up with the idea after working on a separate AR project for Google. After hitting Hollywood last year, the #MeToo movement has worked its way through various industries including advertising, while shedding light on gender discrimination, pay disparities and harassment in the workplace. Tech is a space historically known as a hotbed for those issues, and Google itself has faced recent lawsuits from female employees who claim to have faced systematic discrimination. The Unstereotype Alliance formed at Cannes last year to combat gendered stereotypes in advertising. Other members beyond Google include IPG, WPP, Publicis, Twitter, Johnson & Johnson, Facebook, Mars, Unilever, Mattel and the Cannes Lions organization itself.